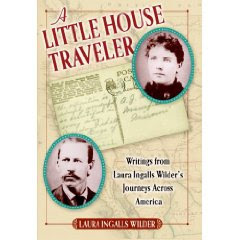 I hadn't heard of A Little House Traveler : Writings from Laura Ingalls Wilder's Journeys Across America until recently. (Then again, I hadn't read the Little House series until recently either!) Perhaps you've heard of this particular book, and perhaps not. What is contained in A Little House Traveler is Laura's diary of her travels with Manly and Rose from South Dakota to Missouri in 1894. It also contains the letters which she wrote to her husband when she was visiting Rose in San Francisco back in 1915. Lastly, it contains her diary/notes during her 1931 road trip with Manly back to DeSmet (on a little mini vacation). I very much enjoyed Laura's letters home to Manly when she traveled further west, to California, to visit Rose. In these letters we find out how she felt about seeing the ocean and sights and sounds of the World's Fair which was in San Francisco at the time. It's hard to imagine that any American would marvel at a great body of water- having not seen one until they were advanced in age. It just goes to show how much times have changed and how far the industrial age took us. Americans today cannot fathom what it would be like to only know one area of the country's geography. Laura seems childlike as she explores the delights which San Francisco has to offer and it is fun to read her perspective on train rides, boat rides and streetcars. I also found her notes from her road trip with Manly in 1931 to be of interest because she carefully accounted for all of their expenses. When I started driving, gas was $0.89 a gallon. One day, Laura and Manley spent $3.03 on SIXTEEN GALLONS of gas! Isn't that just wild! Their total amount of spending for one day of travel, gas, meals and a special treat of bread and doughnuts, came to $4.33. It's hard for the modern mind to grasp and that makes the third section of this book rather remarkable. This book was different than her Little House series. It definitely has a more piecemeal feel to it. It doesn't flow as well (excepting the letters from San Francisco). It sheds little light onto Laura and Manly's marriage relationship, which I think is a very curious thing. Apparently it is to remain so. (I guess I don't really need to understand it.) All in all, this book makes for a nice companion to the Little House series and if you find a copy and are a fan of Laura Ingalls Wilder, I heartily recommend this addition to your collection! Thanks for the link love, Carrie. I'd heard of this book, but haven't gotten around to reading it. Appreciate your thoughts. I think I read some of her World's Fair reactions online (articles for the Missouri Ruralist)? That was pretty interesting. I hadn't heard of that one. I'm with you re travel! One of my favorite books not on the series is a collection of columns she wrote for, I think, a farming magazine. I think it is titled Little House in the Ozarks. She wrote these columns before she started the books, if I remember correctly. Good observations of the changing times she witnessed. Posh travel is preferable to primitive...I agree:) I hope to reread the Little House series later this year, so I may check this one out at a later time. Just checked, my library owns Little House Traveler. Thanks.